Gotta be a real bi-oche in a cross wind. completely blocked forward vision, but it did catch wind. crashed out a couple of times and decided it wasn't a good idea. I don't know, maybe a spinnaker would work on those downwind sections. Wouldn't attach it to the handlbars though... be right back! Needs a jib to be stable and steerable. I tried a jib once, but I didn’t like the cut of it. 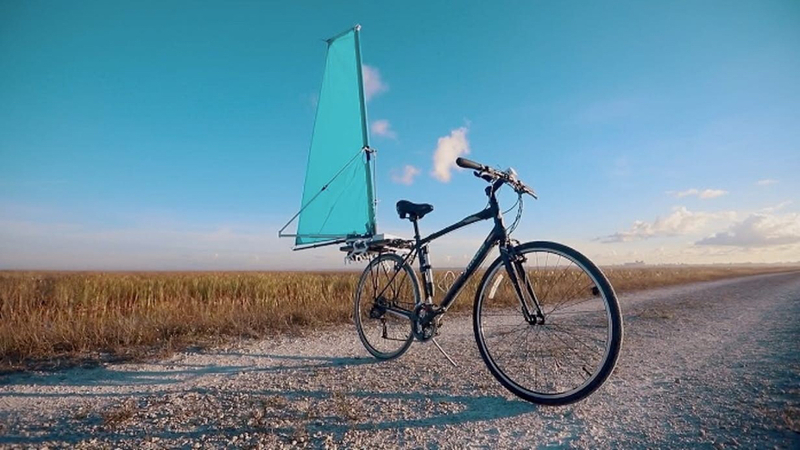 They call it the CycleWing. I’ll call it the road rash. It's on a gravel road! ... somehow that may be worse! isn't that the new specialized shiv? This bike is approved only in countries with socialized medicine. If the good lord in his infinite wisdom had meant for bikes to have sails, he'd have given them keels and made the roads and trails out of water. Clearly the designers didn't watch many Wile E. Coyote documentaries. "No, I Can't Possibly See What Could Go Wrong With GIANT Dragonflies Bred in a Lab"
Gunboat Diplomacy; What could possibly go wrong? Not that anyone would notice. Titanic II. What could possibly go wrong? Privatizing prisons, what could possibly go wrong introducing a profit motive?